U.S. Service Member Killed In Afghanistan's Helmand Province : The Two-Way The service member was on a training mission when a roadside bomb went off Tuesday near the provincial capital, Lashkar Gah. It is the second U.S. combat death in Afghanistan since January. 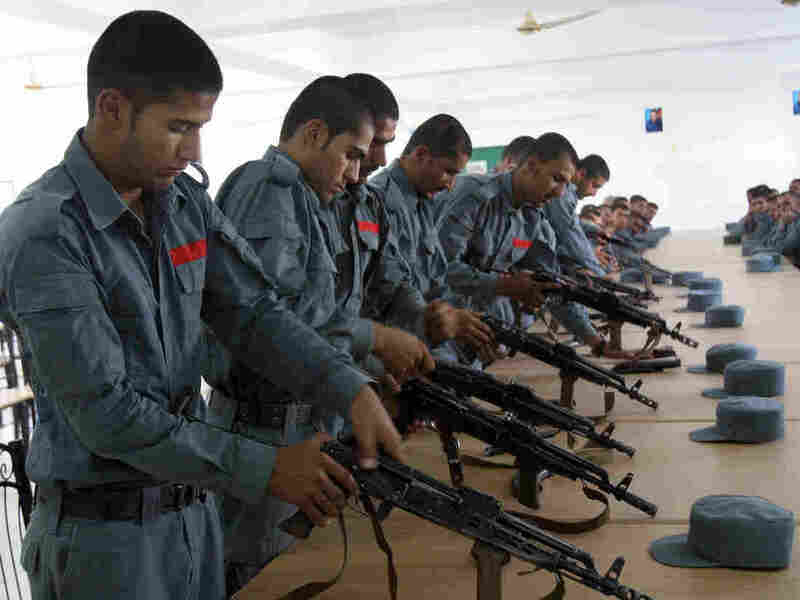 Afghan police train with their weapons in Lashkar Gah, Afghanistan, in July. Hundreds of U.S. troops are deployed to train and assist security forces in Helmand province, where the Taliban have recently made territorial gains. A U.S. service member was killed by a roadside bomb in Afghanistan's restive Helmand province Tuesday — the second U.S. combat death in Afghanistan since January. The service member was conducting "train, advise, assist activities" with Afghan forces when the explosive device went off, according to the U.S. Defense Department. Another American service member and six Afghan soldiers were wounded in the attack near the provincial capital, Lashkar Gah. "We are deeply saddened by this loss, but remain committed to helping our Afghan partners provide a brighter future for themselves and their children," said Gen. John W. Nicholson, commander of U.S. forces in Afghanistan. "[The attack] comes as 100 additional U.S. troops have been sent to Helmand Province to advise and assist Afghan police. "Earlier this year, the U.S. command sent 500 U.S. soldiers to train Afghan troops in Helmand, where the Taliban is seizing more territory and threatening the provincial capital, Lashkar Gah. "Most of the 10,000 American troops in Helmand and throughout Afghanistan are training local troops and work out of large bases. Still, some U.S. special operations troops continue to partner with Afghan soldiers on missions. "In January, an American Green Beret, Sgt. Matthew McClintock, was killed in Helmand in a Taliban attack." "The Taliban have seized a number of nearby districts in recent weeks and now threaten to overrun the city itself. Local officials have estimated that around 80 percent of the province has fallen or is in danger of falling to the Taliban." The Defense Department says 23 U.S. service members have been killed in Afghanistan since combat operations ended nearly two years ago. The slain service member's name is being withheld until next-of-kin can be notified.